When I first started my weight loss journey, there were two things I loved most when it comes to junk food: potato chips and chocolate. Used to be, that was always my dieting downfall. I’d make a list for weight loss: NO chips. No this, no that. But we all know what happens the minute you say, “That’s it. I’m never having a doughnut again.” Suddenly you can’t stop thinking about them! As a full-fledged, card-carrying chocoholic/chipaholic, I could only stay away so long before the cravings became unbearable and I’d binge. After that, I’d feel like a failure for ruining my diet and find myself completely off-track. Although for the most part I now eat “clean,” I finally came to terms with the fact that I don’t want to live in a world without at least some of my favorite goodies. Luckily, I found a way that I don’t have to. I discovered a secret that works wonders for me: single-serving portion control. I’ll admit, at the time, using the word “control” in the same breath as “chips” or “chocolate” was for me an oxymoron. The way I got around that is by buying (or making) only single-serving bags of these snacks — and sticking to eating just one bag at a time. It sounds so simple, but for me this solution was miraculous. If you’re like me and could eat half of a large open bag of chips or cookies without even thinking about it, it’s amazing how many calories you save by not doing that. Literally hundreds of calories at one sitting! What is your favorite treat? Cookies? Chips? Candy? Chances are, you can find an individually packaged portion of it in the store. I became a fan of the little 100-calorie bags of cookies and chocolate pretzels, and of the single-serving bags of potato chips, which come in a multi-pack. I’d only get one box at a time, exactly enough for the week. When I was packing my work lunch for the day, I included a small bag of my favorite fudge mini pretzels; or a homemade individually-wrapped cookie or other treats. It gave me something to look forward to. It worked perfectly for me. And as it turns out, research backs me up on this. A 2012 Cornell University study in the journal Obesity found that 100-calorie packaging greatly helped those who were overweight to reduce consumption. Sometimes it’s hard to find the treats you want in single-serving bags, but it’s very simple to make your own and also more economical. When I buy a big bag, as soon as I get it home I immediately portion it into sandwich-size Ziploc baggies or small reusable containers. I then keep them in the freezer or locked away somewhere so that they stay fresh, and so I’m not tempted to overindulge out of the pantry. Out of sight, out of mind. I never keep treats out on the counter or anywhere I can see and easily grab them. That’s just asking for trouble. We’re only human. The freezer became one of my biggest portion control tools, and it still is. During a low-carb stint, I decided to switch to peanuts and nuts as a snack, because it seemed like a healthier option than a grain. 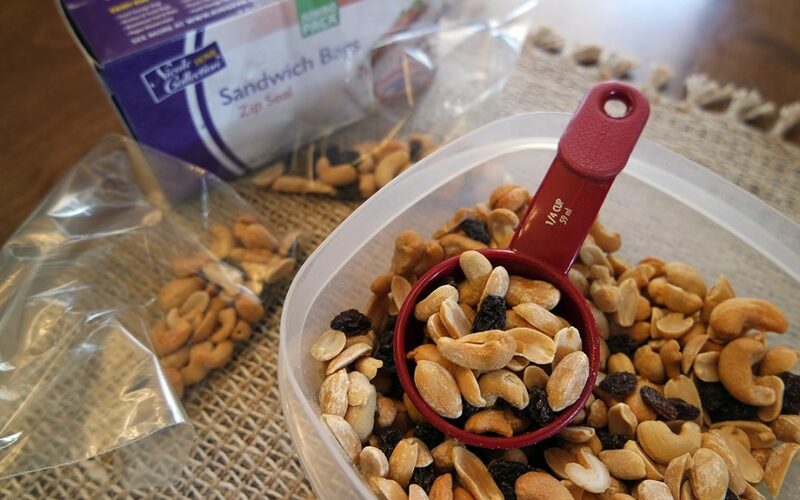 So I started eating peanuts and even created my own trail mix, and had it every day when I was hungry for a snack. It was delicious and filling. But imagine my surprise when I started gaining weight. I couldn’t understand it — I was replacing the bars with nuts (fewer carbs and no grains, so that’s good, right?). I’d also given up my potato chip and chocolate pretzel habit during this time. So that was saving some calories, right? Why would I be gaining weight? Then I researched how many calories are in just one cup of peanuts, and…826 calories?!! Whoa. That’s almost as much as a Big Mac and fries! Every day! No wonder I was gaining weight. I was previously eating 400 calories in protein bars a day and replaced that with at least a cup of nuts, if not more, resulting in an additional 400+ calories a day. And I didn’t even realize it. The fact is, even if you have a healthy diet, calories count. It’s simple math. What I decided to do about that isn’t give up the nuts, since I enjoy them. Instead, I used my portion control trick and doled out 1/4 cup portions (about 200 calories) into sandwich-size Ziploc baggies. I made enough for the week — one bag for the morning, one for the afternoon. Sure enough, that solved the problem. At first, the single-serve amounts seemed so tiny compared to what I was used to. But over time, my appetite and my eyes began to adjust to the smaller servings. I also found that by getting used to smaller portions, I actually enjoy the food more. I’m not wolfing it down; I’m slowing down and enjoying each piece. That actually makes it a far more satisfying experience than mindlessly overeating. Plus, zero guilt! By accepting my cravings and including a favorite treat each day, I don’t feel deprived. I can enjoy the foods I want and still control my weight. Moderation, rather than deprivation, was a key to my weight loss and maintenance success. Give it a try and see. What food is your snacking downfall?